Shoes: Remember – it begins and ends with our shoes – there is no more critical piece of equipment. Every person has a specific type of foot that would benefit from the proper shoe. Running shoes should be replaced every 400-500 miles. If not, you’re risking a host of injuries including joint, foot and shin pain. Socks: Synthetic fibers – no cotton! Look for “true running socks” made with synthetic fibers like “Coolmax” which will wick moisture from the skin and keep your feet dry. Consider a double layer sock (like Coolmax Wright sock) for added blister protection. An expert can help find the shoes and running gear specifically for your needs. Our OrthoNebraska Running Specialists return to Scheels this month, always the third Wednesday of the month. Please come visit from 5:30-7:00 pm on Wednesday, January 16th. The physical therapists set up in the woman’s shoe section and you will receive a discount on shoes purchased that evening. Remember to check back on the blog periodically for more running tips and information! 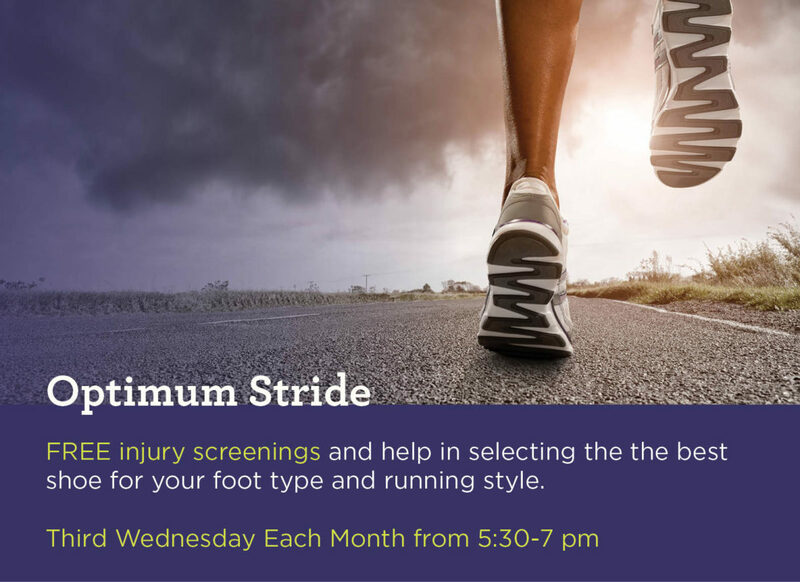 Please feel free to contact any of the Optimum Stride therapists with any further questions at Optimumstride@orthonebraska.com. Best of luck with your training!